There's a trend in wearable technology to keep imbuing more devices with ever greater technology to give us more data about how fit we're getting. 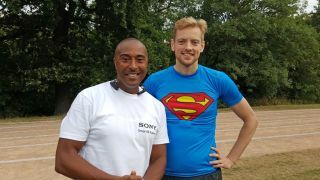 That's why I was standing in Regent's Park in London at the centre of a dusty running track with Colin Jackson, learning about how many sensors Sony's new Smart B-Trainer has packed in. "We're eliminating these little obstacles, whether it's motivation, the purely practical side [of exercising] or just feeling that you don't know what you're doing." "I don't do any races. No 5Ks, 10Ks, all the competitive stuff is way, way behind me now. I've set up a 5K run called Go Dad Run, which is an easy 5K run get people involved with, but I've never run one of them myself." Of course, he does still train – the gym routine sounds horrendous, while the running training seems rather short but still brutal, flinging heavy tubes around to improve core strength while on the move. "I feel most comfortable with 5Ks, as by the time you get into the groove, it's over. That works wonderfully well for me," he says, laughing, while I pray he never turns up at my local Parkrun. Being the narcissist I am, I turn the conversation to me and my training, hoping to get some better tips to break my 10K than from Nico 'just keep running fast' Rosberg. "I'm going to suggest you keep everything the same, but two days before the event do no running whatsoever. None at all. Barely move." Wait… what? He's laughing again. Hopefully not at me. "What tends to happen then is your body will relax, and you won't have those extra fatigue factors - minor ones you don't generally feel because you're just walking around being active. "Because when you're training, your body is always trying to repair - it's that repair that improves you and make you better. What you need to do is knock it all the way down and take two days off [before the race] – well, three days off is better but I know you runners… it'll kill you if I say that!" I like this. He's called me a runner, and apparently repairing the body through non-movement being ideal preparation? If only I can get him to say that Twixes are ideal race fuel, I might ask this man to be best man at my wedding. "One key thing: eat well but DON'T change your diet," he says, ruining my dreams. "People do that all the time: in the build up for a marathon they suddenly decide they need to eat loads of carbs. "But if you've not been training much on them and suddenly start using them then your body isn't used to extracting that energy from the system." If you have cheese and pints, keep having cheese and pints... although I wouldn't suggest that's a good idea!" "Just keep to your basic routine, take those two or three days off and then give me a call – I bet you're down to 39 minutes." I might ask him to be a groomsman. Regular readers will know I've been training up Runner G – someone who's never run in her life, but was constantly telling me she 'wants to start' – to do a 10K race in September. Credit: Flickr. Image size modified. She's been using the Adidas MiCoach program since the first day of June, which offers real time feedback when running to make you feel bad when you're too slow (or too fast) – so I decided to grill her (using the more lazy Q+A format) on how she's feeling, and how the technology I've shoved at her is helping her out. Why did you want to start running? I used to play football for years and then stopped after university. I moaned for two years how unfit I had become and that I couldn't be bothered to do anything. I hated being the only one in a conversation not having anything to say about fitness when everyone at work was talking about it. So many people kept telling me how easy it was to start doing exercise but I didn't want to know, I was happy to moan. You've been given loads of tech to try – what's worked the best? Wireless earphones and Spotify Running. I couldn't live without them. I've heard 'real' runners don't run with music but as a newbie, I love the distraction and Spotify Running has just kept me going since I started in June. The best thing for me has been the adidas MiCoach app – it's been simply amazing. I found it really easy to use, easy to see my stats and compare myself to previous runs. I like that choosing a plan at the start means I can see what I have to do each week, plus it acts as that coach who used to shout on the sideline. I need someone always telling me what to do, when to run, where I slowed down, where I sped up – info I didn't care about before but now I love. You've also been using the Adidas FitSmart (the heart rate monitor on your wrist) – how have you found that? The watch has been slightly confusing. Mid-run I press it to see how long is left and how fast I'm going etc, it flashes with some info and I have no idea what it means. I keep reading that I should care more about my heart rate and what it means etc, but for a newbie I don't feel I need it. I care so much about distance and comparing it to previous runs to see how I'm improving. How are you feeling compared to when you started? Do you feel confident for the race? In my first week I was so excited about starting the programme, being part of something and eager to get fit. It was bloody hard; I walked at some part of each workout for a good two weeks. I'm surprised how fit I've started to feel in such a short space of time and how much I've pushed myself… and am starting to finally listen when I'm told to conserve my energy and not go too fast at the start of each run. Moreover, I've definitely realised how psychological running is. My head is often the only thing holding me back (especially after I'd invested in some trainers and decent sports bra). Back at the end of June I took a look at my workouts scheduled for July and thought 'Oh no, how am I going to run 20 minutes without stopping?' Now I can run almost 40 – without walking once. I'm lucky to have someone helping me who knows the processes of fighting through pain, learning to understand your body etc. If I was by myself I definitely would have walked at times I didn't need to. I'm so excited for the race, terrified but excited. I'm already thinking about a half marathon, I'm hooked. When I plan my week the first thing I think about is 'right what days can I run' and I feel the need to talk to everyone about it. Yes, I'm still not going very far, but I can do it without walking and I haven't missed a single run since I started. I feel amazing.